This week, Apple is flexing to impress. The iPhone-maker officially announced its tightly controlled App Store has surpassed the 100,000 mark when it comes to available applications. A hundred thousand -- that's a lot of apps, especially compared to other platforms' far more limited offerings. But, to revisit the age-old question, how much does size really matter? Does anyone actually need a selection of 100,000...of anything? In the case of the App Store, it appears that despite the impressive nature of its big and firm number, the way we use the catalog may count far more than any measurement. The sobering statistics come courtesy of AppsFire, an app tracking and sharing service that caters to iPhone customers. AppsFire analyzed the 100,000-plus apps in Apple's App Store to see how many were actively installed on users' devices. Its conclusion: not very many. 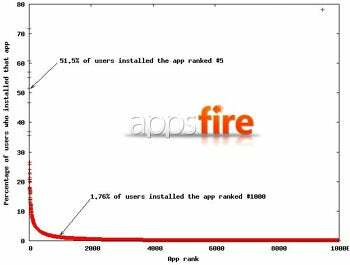 According to AppsFire's analysis, by the time you hit the 1000th app (as far as popularity), you're looking at only 1.76 percent of users with the program installed. Once you pass the 2000th program, the number of active installs is barely a blip on the radar. Yep -- the overwhelming majority of apps are simply sitting unused. All right, time for a reality check: Does this finding take anything away from the App Store's success? Not in the least. Apple's managed to build up an extraordinary array of high-quality offerings, and that's something no raw number can assess. But does the finding take a bit of steam out of the company's size-centric marketing push? You'd better believe it. Bear in mind the timing of all of this: On Friday, Verizon's Motorola Droid hits stores nationwide. The phone is already being hyped as one of the first serious iPhone contenders -- but, despite its standout features, the size of the Droid-connected Android Market has been widely cited as a key limiting feature. The Android Market's 10,000 apps, many have suggested, simply can't compete with the App Store's 100k-strong selection. Seeing how few of the App Store's 100,000 apps are actually in use certainly brings that idea into question. Now, there's still the notion of quality: Do the Android apps hold a torch to the iPhone's when it comes to what they offer and how well they perform? That's a subjective question you'll have to answer for yourself. When it comes to sheer numbers, though, you may want to think twice before letting an extra zero make up your mind. JR Raphael writes geek humor at eSarcasm, home to more than 100,000 tech-related jokes. He has never once had success using that as a pickup line.